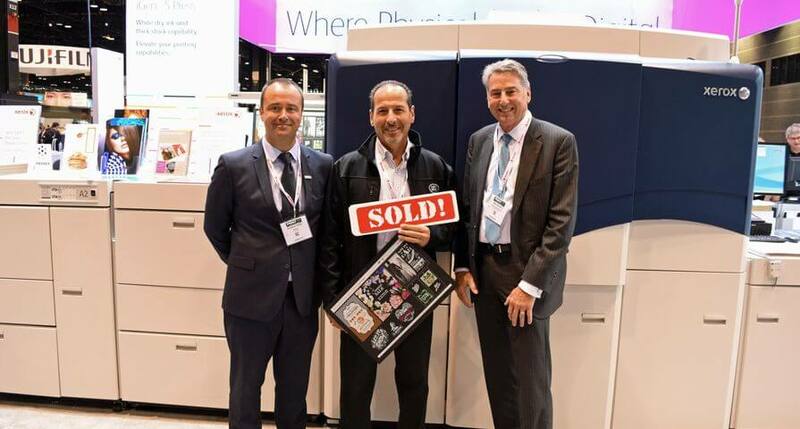 Westkey Graphics, one of western Canada’s largest privately-owned print providers, has purchased White Dry Ink for the fifth station of its Xerox iGen 5 Press at PRINT 17. With this addition, WestKey Graphics becomes the first print provider in North America to have all five ink options for the iGen 5’s fifth station – enabling them to take on new applications that replicate client brand colors. According to president and CEO Alfie Karmal, the firm previously resorted to offset for color matching – a less profitable way of printing short runs. Additionally, some clients had a preference for more matte-quality finishes, which meant jobs needed to be outsourced. Demand was also high for weighted stocks in the production of short-run, point-of-sale materials and packaging. With the I Gen 5, Westkey will be able to produce digitally printed folding carton packaging, such as gable and wine boxes, as well as flexible labels and high-end point-of-sale pieces with full variability. Along with increased digital color accuracy, matte-finish options, short-run flexibility and the use of thicker stock materials, additional orange, green, blue, Clear Dry Ink and White Dry Ink capabilities for the fifth station allow for specialty font and image enhancement. Today, thousands of iGen presses are creating billions of high-quality, high-margin sales brochures, posters, photo books, packaging and pieces of direct mail – often personalized and always vibrant in color. The Xerox iGen 5 Press is built to serve the changing world of print and aims to help print shops seize market opportunities through automation, integrated print workflows, a fifth color station and the option to swap in White Dry Ink for specialty effects. These features provide commercial printers with the power to meet demand and grow quickly.